The furniture arrived in good time-huge thanks for organising it. And it's all BEAUTIFUL!!!! Impressed with each and every aspect of your business and the way you do things. The quality and meticulous attention to detail is noticeable everywhere, even down to the fun of having a Union Jack cocktail stick to assist in the assembly. Made us smile! There have already been "ooh's & aaah's" from everyone that have seen them. My chair arrived this morning and I've just constructed it (brilliant, easy to follow instructions). I love it. Not sure I'll be leaving my chair for the duration of the summer it's so comfortable! Definitely the best item of garden furniture I've ever invested in. Thank you. We supplied a Iroko chair to this lady in Eastbourne in July 2017. Thank you once again for the beautiful chairs and excellent customer service. 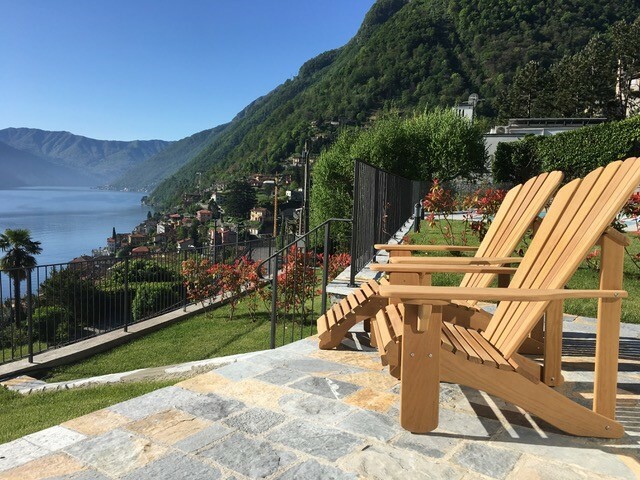 We shipped these Iroko chairs with a matching legrest to a quie stunning location on Lake Como in Italy in March 2017. Ian, just back from a holiday week in the lakes. Opened the boxes , assembled chairs and footstools - so straight forward! Margo ( birthday girl) is delighted, the chairs are works of art, beautiful and very well made. We supplied 2 Iroko chairs for a birthday gift in March 2017. This kind review was left by an Edinburgh customer who purchased an Iroko chair in August 2016 . Thank you SO much for my gorgeous chair and footstool which arrived today. I couldn't wait to get home from work to try it out. It's taken pride of place in the garden and looks fabulous. I've had back surgery, so finding a comfortable chair is quite tricky but this is amazingly comfortable and I know that I'll get so much pleasure from using it. It is so beautifully made and thank you for making it such a pleasurable experience ordering from you. We supplied a Classic Oak Chair with a matching footstool to this lady from Bristol in August 2016 . Dear Ian, just a note to say how delighted I am with the chairs. They are so easy to put together. They are beautifully crafted and worth every penny. I love them and wouldn't hesitate to recommend you to anyone wanting these super crafted, comfortable, beautiful chairs. We supplied this happy customer in Worcestershire with some Iroko chairs and footstools in June 2016 . The birthday boy is absolutes thrilled with his chairs which are so beautiful! Thank you so much for your careful and expert craftsmanship. He is delighted as am I....and the personalised letters are perfect. 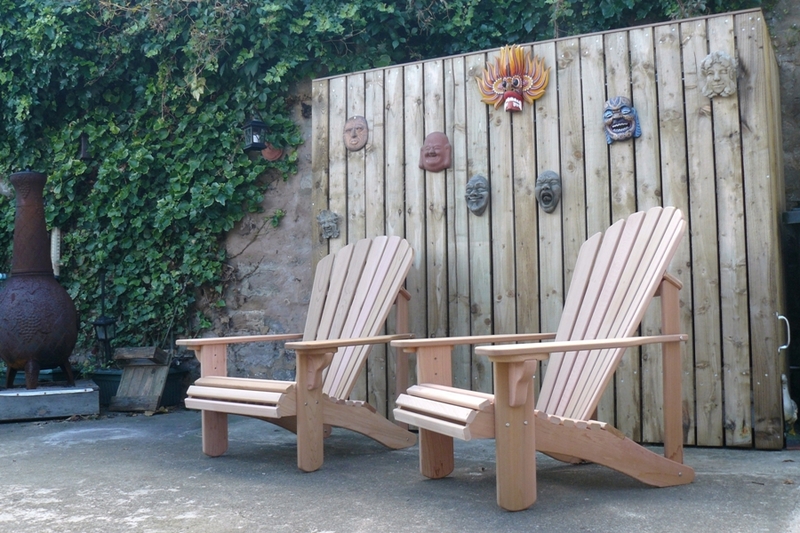 This customer in Hampshire purchased 2 Basic Adirondack Hardwood chairs in Iroko with a personalisation for her husband's birthday. Just wanted to send you a quick message to say how pleased we are with our Adirondack chairs. They arrived bang on schedule on Friday and the delivery man was happy to put them in our safe place them after I left a note as you suggested. The furniture is amazing, really well made from beautiful wood and very easy to put together. If it weren't for the fact we've decided to oil them I'd be sitting in one of the chairs now! We're very happy customers and will definitely recommend you to others. Thanks again for getting them to us so quickly. I just wanted to let you know how much we love our chairs. I am such a fuss pot about how things look, and my husband Warren is an ex-naval engineer so for him it’s all about the build quality and finish, and we have both been blown away by the obvious care and attention to detail - they are truly beautiful, and incredibly comfortable. 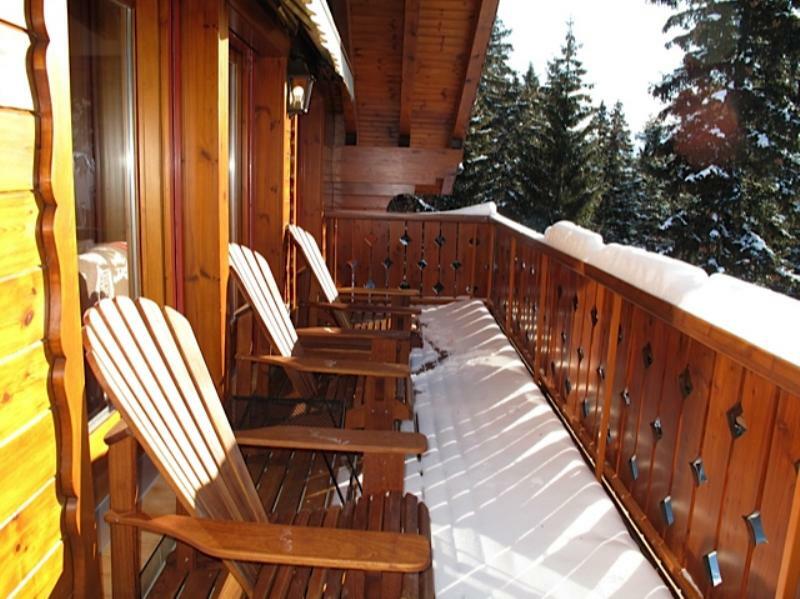 All we need now is some nice weather…! Thanks very much for your help, and the excellent communication throughout the buying process - it really has been a pleasure. Just a note to say thank you so much for the chairs. My order was processes with speed and courtesy all the way. A month in the garden now! Superb craftsmanship, so comfortable to sit in and fantastic to look at every evening as I drive in home. 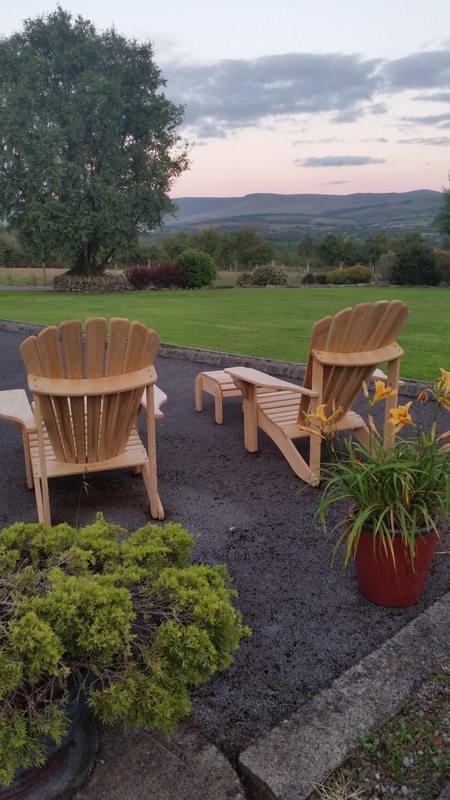 We shipped two Classic Oak chairs to County Tipperary at the beginning of July 2015 for this Irish lady. She was kind enough to share her wonderful view in this photo. Hi there. Just a quick note to say a big thank you. The 2 x classic chairs arrived today. Mrs Ryan is already sunning herself with a massive smile on her face ☺ Awesome. Just to say the chair arrived safely, is now built and we are very pleased with it. Top quality - well packaged, easy to assemble and a good solid, comfortable and attractive finished chair. We have just assembled our chair and are delighted with it. The quality, design and finish are exceptional. I hope we will find space for another one! Many thanks. We supplied a Classic chair in Oak to this lady in Flintshire in October 2014. My husband made the chair up at our house and I tried a gift bow and thank you card on to it before we carried it over and sat it on the porch patio at James' house. The look on James' face was priceless - it was such a surprise! As well as being my singing teacher, James is also a teacher of the Alexander Technique and the Adirondack design exemplifies all of the posture principles, he was thrilled at such an unexpected gift. It was wonderful to sit in and will give him such pleasure in the future. Thank you so much for such a pleasant transaction, I really appreciated being kept informed at the various stages of build and delivery. So glad I found you! This lady in Kilmarnock purchased a Classic Oak Chair with some engraving as a gift in August 2014. Yesterday we sat in our Adirondack chairs and raised a glass to Thomas Lee who invented them and to Ian Barley who made them with such exquisite precision and craftsmanship. Nice to be appreciated by this customer just North of Inverness to whom we supplied 2 Classic Oak Chairs with footstools in August 2014. Loving our new chairs in sunny, for the moment, Luxembourg. They exceeded expectations. We sent 2 Classic Iroko Chairs with matching footstools to this lady in June 2014. You can see them in our Gallery. Just wanted to let you know how pleased I am with my new chairs. They are wonderful and greatly admired by my family and friends. This lady in Bristol purchased 2 Iroko Chairs with footstools in May 2014. Ian, thank you for our wonderful chair which you delivered. It's beautifully made and extremely comfortable. Delighted with it and the great service. Thank you! We supplied an Iroko Chair with some engraving on the back to this lady in Weybridge in May 2014 . We supplied 2 Iroko Chairs to this lady in Norfolk in May 2014 . Adirondack chair arrived safely. Quality superb and all that we had hoped for. After many years assembling items of all sorts the minimal assembly required was a blessed relief. It was readily apparent that the chair had been fully assembled before being partly disassembled for shipping. Everything fitted perfectly with no fettling required! Very strong and comfortable with a lot of little touches (carefully contoured seat - screws covered by wooden plugs and arms taylor made for supporting the drink of your choice!) - very evidently a lot of thought has gone into this iteration of a famous design to produce the best possible result. What initially caught my attention on your website was the higher than usual back brace for the back slats - a lot of Adirondack plans (as I am sure you are aware) have this lower at the level of the arms - yours is stronger more rigid and from the back more attractive. Rather like the best cars - the chair looks good from any angle. Your quite evident integrity is reflected in your work. Thank you so much for this lovely chair. We will be ordering a second one soon but a new settee and the recovering of an old one take precedence - we shall have to fight over this one in the meantime! This email was sent to us in April 2014 after supplying an Iroko Chair with a legrest. Just a quick note to say that we received the chair and stool today. The items both beautifully made. I had an enjoyable and stress free time putting them together, the best self assembly furniture ever! They went together like a dream, your pre assembly is a very good idea! The design is very well considered and the quality is first class. We are really delighted with them, having waited years to buy, we now wished we had dived in sooner. Happily sitting in the chair as I write this.....Here's to a long hot summer! I've never ever sat in such a more comfortable wooden chair before, and to the point I don't think I'll even need cushions, I know I'm going to have many comfy days resting in my new chair, chilling out with a nice glass of wine on those warm sunny days enjoying my garden even more so now. We received this email in March 2014 after supplying an Oak Chair with a footstool and legrest. Many thanks for delivering our two Adirondack chairs this week. May I say that we are really delighted with them. I think they are brilliantly made, perfect in fact and I'm sure they will give us many years of pleasure. Your service was excellent and I want to wish you every success with it. We just wanted to let you know how delighted we are with the four chairs that we bought from you. You also kindly delivered them to us in time for the Bank Holiday which was very kind. The chairs not only look great, but are the most comfortable garden chairs we have ever sat on, it is hard not to spend all day in them! Friends have also admired them for the same reasons and we have gladly recommended you. We hope to add to our collection in the future. Our chairs came today as you said they would, well packed, I could not wait to put them together, so easy to put together 15mins later we had a A1 chair, 15mins later mine was together , that afternoon all jobs cancelled while we sat back in the sun & dosed. Yes we had seen cheaper, but these are GREAT A1. Thinking of buying two more for our conservatory. Keep the quality up . Message: came across you on the from Britain with love site, we bought chairs from you 10 years ago, and are as solid as ever! This message was sent via the website in April 2013. We're glad that the two Classic Iroko chairs we sold this lady in 2002 (so it's really 11 years) are giving good service. Hi Ian, just a quick note to say that the chairs were delivered yesterday. No problems with assembly. I enclose a photo of them in position. Thanks again - great product. We supplied a Classic Chair in Western Red Cedar with a matching footstool as a birthday gift on behalf of this customer in Northern Ireland. I just wanted to let you know, rather belatedly I know, how thrilled we are with the chairs you supplied. They arrived individually and well packaged and were simple to put together. They are wonderfully sturdy and a delight to use being both beautifully comfortable and very handsome to look at. Although we bought them for the garden, they are currently in our summer house where they look very much at home. Maybe we will have to order some more for the garden one day! Just to let you know that the chairs arrived safely yesterday morning and I assembled them last night. They're now sitting very nicely next to the ones we bought in 2009. I'm surprised how well the older ones have aged as when we put the next to the new ones there really isn't that much difference apart from a bit of sunbleaching! We supplied 2 more Basic chairs to match the original ones that are shown in the first three pictures on our gallery page. We finally assembled our chairs yesterday! Sat back and enjoyed the evening birdsong! Two Classic Oak Chairs with matching footrest have found a good home. Just to say the chairs arrived on Wednesday as promised. My husband put them together easily and they are now in pride of place on our new Cornish deck. They look great and we are delighted with them. Two Classic Cedar Chairs supplied to this lady. I thought I would let you know that the chairs have just arrived, my husband has assembled them and we are sitting on them in the sun! We are thrilled to bits with them and are very impressed with the quality. Thank you. We look forward to receiving the stools I ordered yesterday - hope this sunny weather continues! We supplied 2 basic chairs to the Wiltshire customer. Just wanted to thank you for the excellent service and high quality furniture. We assembled it when it arrived and have already tried it out. The chairs are very comfortable and the armrests ideal for holding a wine glass! A very stylish addition to our garden. Thanks again. We supplied 4 basic cedar chairs to this lady in Banbury. Thank you Ian for the beautiful chair. I love it. This basic chair that we supplied seems to have hit the spot. We supplied this lady with a classic chair. I just wanted to drop you a line to say how much I love my Adirondack chairs and foot stools. I've had them now for a couple of weeks and just managed to get them painted and sit in them the once before the rain set in !! They are wonderful and we were really pleased with how easy they were to put together, all the screws lined up properly ! They also arrived the day after you shipped them which was an added bonus! So, once again, thank you. just a quick email to say how thrilled I am with my new chair - it is absolutely brilliant - perfect with a cup of tea! I received the above chair on Tuesday and just wanted to say how pleased I am with it. I'm particularly pleased with the finish and look of the chair, the proportions are just right and really look good in my garden against the backdrop of a large oak tree. This lady from Essex ordered one of our basic Cedar chairs. Thank you very much for the classic western red cedar chair. William Morris said you should have nothing in your home that you do not believe to be beautiful or know to be useful and this chair qualifies on both counts. We're fighting over who gets to sit in it. We built a Classic Chair in Western Red Cedar for this lady from Wiltshire. Finally I have time to send you a mail to say how well the 5 Adirondacks you made for us in April have settled in at the bottom of the garden. They have come through several gales and haven't moved an inch, and are now weathering into a lovely colour. They are our favourite place to sit and watch the sea and one of our daughter's favourite places to play. This customer has a spectacular cliff top garden and we are very pleased that these chairs have found a good home there. Received by us in an email.